Rejecting the derogatory term "Gringos" and the accusatory epithet "Yanquis," Cubans prefer to refer to us, their North American neighbors, as "Yumas." This blog is simply one Yuma's way of sharing his thoughts on all things Cuban, a subject that often generates more heat than light. Activistas de la sociedad civil independiente hemos acordado la promoción de un grupo representativo que actúe como canal de diálogo con las instituciones internacionales y otros posibles interlocutores. REMINDER: Cuban novelist Leonardo Padura will be visiting us in New York City early next week, appearing at four public events between Mon., Feb. 24 and Wed., Feb. 26. Christine Armario of the AP caught up with Padura at Books & Books in Miami and posted the story, "Cuban Writer Padura Tests US Literary Waters," today. Also, BOMB magazine recently ran an excellent interview of Padura by the late Cuban-American novelist Óscar Hijuelos. "The End of Utopia? 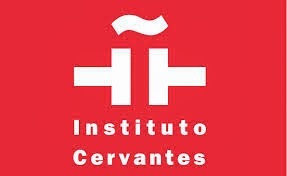 ": Inaugural book launch of the new English translation of "The Man Who Loved Dogs" - Mon., Feb. 24, 7:00 p.m. - Instituto Cervantes - 211-215 East 49th Street - Moderated by Baruch College Professor Ted Henken. In collaboration with Farrar, Straus & Giroux and BOMB Magazine. Free admission. In English & Spanish. Reception with Spanish wine to follow! "Global Cuba: On Translating and Being Translated": A conversation with internationally renown, bestselling Cuban novelist Leonardo Padura and Anna Kushner, translator of Padura's noir historical novel about the assassination of Leon Trotsky, "The Man Who Loved Dogs." Tues., Feb. 25, 6:00 p.m., CUNY Graduate Center, Room 9205, 365 Fifth Avenue (@ 34th Street), Program in Hispanic and Luso-Brazilian Literatures and Languages. Seating is extremely limited - RSVP with @ElYuma. "A Conversation with Leonardo Padura": The Bildner Center hosts the noted Cuban novelist and journalist - Wed., Feb. 26, 12:15 p.m. - CUNY Graduate Center, Skylight Room - 365 Fifth Avenue (@ 34th Street). This event will be in Spanish. 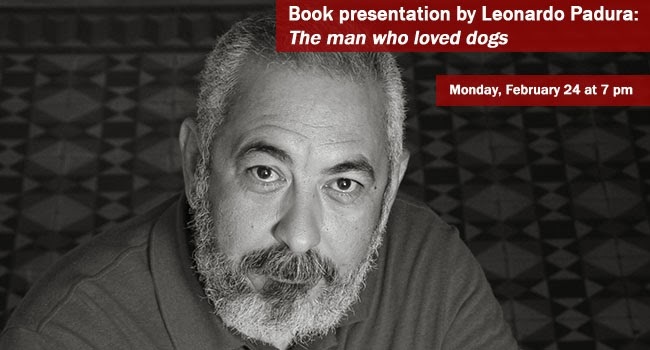 "Words Without Borders hosts an evening with Leonardo Padura": Join Leonardo Padura, translator Anna Kushner, and Words without Borders reviews editor Jonathan Blitzer for a reading from "The Man Who Loved Dogs" and a discussion of the author’s work. Wed., Feb. 26, 7 p.m., 61 Local, 61 Bergen Street, Brooklyn, New York. Do you know who YOUR comrades are? Find out tomorrow night at the NYC New America Foundation! Tomorrow night, Tuesday, February 18, 2014, here in NYC at the New America Foundation (RSVP here), the intrepid tech journalist Emily Parker will launch her eminently readable new book on the struggle for Internet freedom in China, Cuba, and Russia. 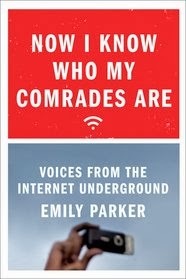 Entitled, Now I Know Who My Comrades Are: Voices from the Internet Underground (Sarah Crichton Books, 2014), Parker's subtitle really highlights the unique contribution her book makes - she tells the stories and shares the actual voices of bloggers, cyber-activists, and techies in each of the three countries who are struggling on the front lines of the "Internet Underground." Another unique thing about the book is that Parker's familiarity with and shoe-leather reporting in each of the three countries - combined with her inviable language skills and sustained friendships with many leading bloggers in each place - enable her to paint a rare comparative portrait of the unique challenges faced by cyber-activists in each country. "Isolation, fear, and apathy keep authoritarian regimes in power. So what happens when people overcome these feelings?" Read the book to find out some of her answers and to meet some of the impressive activists in each country, such as Michael "Anti" in China, Laritza Diversent, Yaremis Flores, and Reinaldo Escobar in Cuba, and Alexey Navalny in Russia. 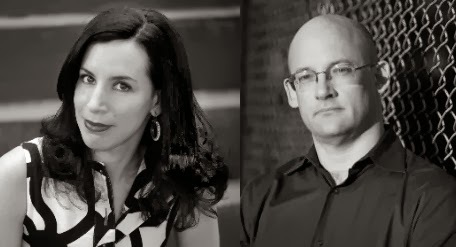 Emily Parker (left) will appear together with leading tech author Clay Shirky (right) on Tuesday, February 18, at the New York HQ of the New America Foundation. If you can't make it to the NAF, Parker will be appearing all across the eastern seaboard this spring, including a stop at Books & Books in Coral Gables on March 6. I imagine that she'll be there together with Laritza Diversent and Yaremis Flores - both prominently featured in her book - given that they are spending the spring semester studying at Miami Dade College! The Cuban Research Institute (CRI) along with Books & Books will be hosting a book presentation on Thursday, February 20th at 7:30pm in the Coral Gables Congregational Church (located across from the Biltmore Hotel). This event will feature Cuban writer, Leonardo Padura, who will be presenting his books "Herejes" and "The Man Who Loved Dogs". This event will be is a great opportunity to attend for those of you that were not able to obtain tickets for our event with him at FIU. Please call to RSVP if you will be attending and please share information with others who may be interested. We hope you can join us! As announced in my previous post, Cuban novelist Leonardo Padura will be visiting us in New York City in late February and appearing at four public events between Mon., Feb. 24 and Wed., Feb. 26. Leonardo Padura was born in Havana, Cuba in 1955. A novelist, journalist, and critic, he is the author of several novels, two volumes of short stories, and several nonfiction collections. His novels featuring the detective Mario Conde have been translated into many languages and have won literary prizes around the world. 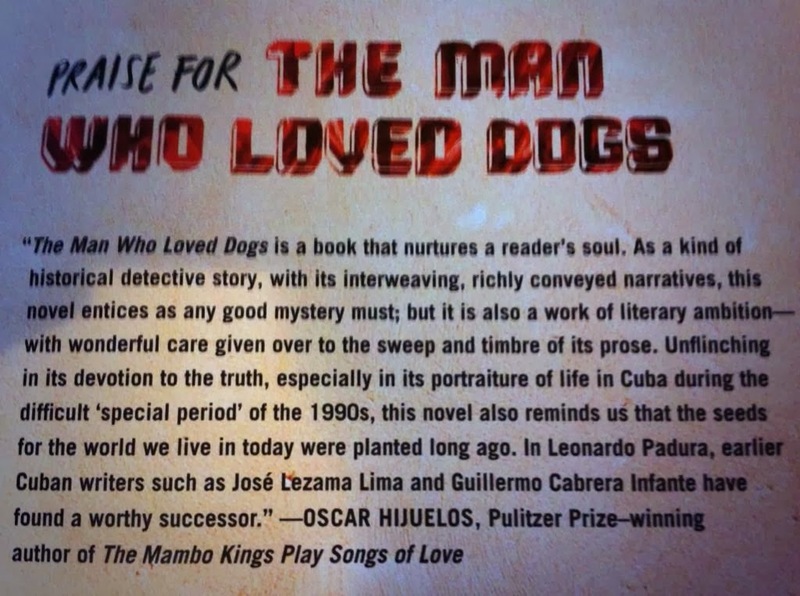 "The Man Who Loved Dogs" was a finalist for the Book of the Year Award in Spain. Padura lives in Mantilla, a suburb of Havana. Anna Kushner translates from Spanish, French, and Portuguese. She is the translator of the books "The Halfway House" by Guillermo Rosales (New Directions), "The Autobiography of Fidel Castro" by Norberto Fuentes (W.W. Norton), "Jerusalem" by Gonçalo Tavares (Dalkey Archive), "Leapfrog" by Guillermo Rosales (New Directions), and "The Man Who Loved Dogs" by Leonardo Padura (Farrar, Straus and Giroux). Her writing has appeared in Dzanc Books Best of the Web 2008, the Bucks County Writer, Crab Orchard Review, Ep;phany, and Wild River Review. Jonathan Blitzer is the book reviews editor at Words without Borders. His writing has appeared in the New York Times, the Wall Street Journal, and the Nation, among other places. He is on the editorial staff of the New Yorker. The Most Important Thing for a Livable World, is the Dictum of Jesus of Nazareth: LOVE ONE ANOTHER. Rubio envia a Jacobson un Hellfire. Jacobson responde con un Minuteman. 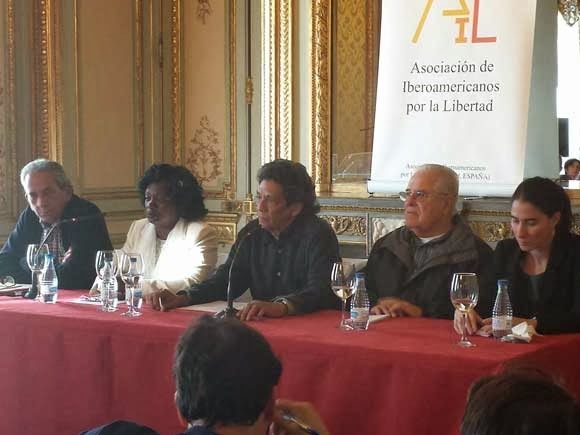 Declaration of “Convivencia” Magazine on the Restoration of Diplomatic Relations Between Cuba and the U.S.
¿Cómo adherirse al Manifiesto Cívico? Haruki Murakami, Clare Cavanagh, David Bellos, Alice Kaplan, Peter Cole, Eliot Weinberger, Forrest Gander, and José Manuel Prieto. Soy original de Pensacola, Florida - "La Riviera de los Redneck". Ávido de rodar por el mundo escapé a Massachusetts para hacer la universidad. 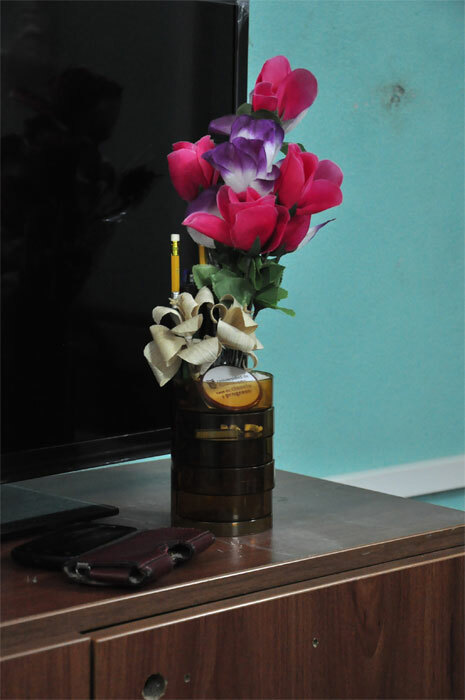 Luego enfilé proa hacia el sur y vine a tirar el ancla en Ecuador, donde enseñé inglés durante 18 meses. De regreso a los EE.UU. hice escala en “La ciudad que el viento se llevó y el gobierno olvidó”: Nueva Orleans, que me acogió como suyo por 7 felices años. Ahora sin embargo soy un orgulloso neoyorquino. Mis ciudades favoritas son Nueva Orleans, Nueva York y La Habana. Actualmente imparto clases en la Universidad y me encanta enseñar. También me place mucho ofrecer hospitalidad a los amigos que llegan de visita a esta ciudad, cuyos mil y un barrios suelo explorar en mi bicicleta. @@@ I'm from the heart of the Redneck Riviera (Pensacola, Florida), escaped to Massachusetts for college (Holy Cross), and again to Ecuador for a few years. I lived for 7 blissful years in "The City that Care Forgot," New Orleans, Louisiana, and am now a proud New Yorker. My favorite cities are NOLA, NYC, & La Habana. I'm a college professor here in NYC, love teaching, hosting friends visiting the city, and exploring the 1,001 different neighborhoods on my bike.